Part incubator, part greenhouse and part time machine, a cold frame is anything but cold. It’s an empty, bottomless box that protects plants from winter weather. 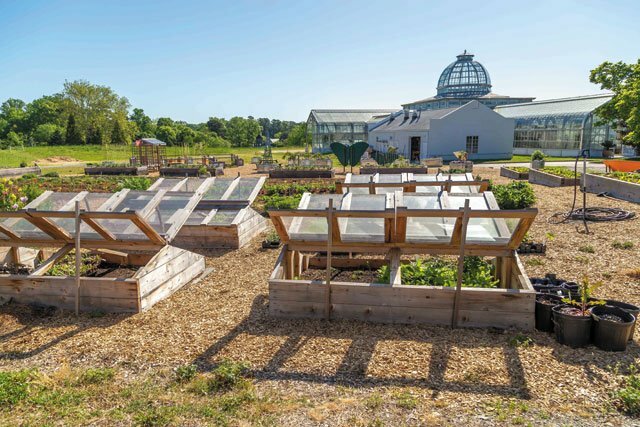 With its hinged lid of glass or rigid plastic, a cold frame captures solar energy and converts it to radiant heat, creating a warm microclimate where plants thrive. Like the windshield of your car on a cloudless day, sunlight passing through the glass is absorbed by interior surfaces and re-radiated as heat. It makes for a snug, safe space for plants to grow when the weather is inhospitable. Sara Barton is a big fan of a cold frame. Barton got her master’s degree in public health from the School of Public Health at City University of New York, but she likes to say she got her work experience “in the field,” on an organic farm. Since 2017, Barton has been the Learning Garden Coordinator with the VCU Office of Sustainability, where she manages three urban campus green spaces.